See celebrity homes and the elite shops on Rodeo Drive on this morning or afternoon Segway tour of exclusive Beverly Hills. Admire lavish mansions, hotels and boutiques as you travel in style through this ritzy enclave. Instead of being just another tourist on a bus tour, be part of the scene in this famous town on your eye-catching personal transporter that allows you to cover lots more ground than walking! 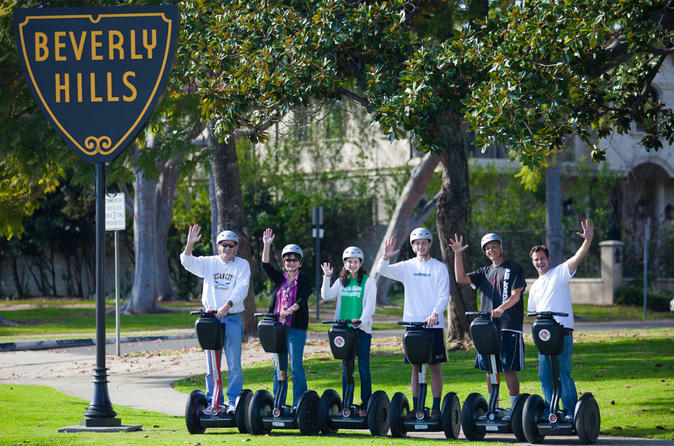 Your Segway tour begins in central Beverly Hills with a safety briefing and instruction session. Segways are easy to learn, and you’ll quickly find yourself ready to hit the streets and explore! Listen to your guide provide a quick rundown of the history of Beverly Hills and the various landmarks you pass. See extravagant homes on Wilshire Blvd and Benedict Canyon Drive of famous celebrities. Admire the Beverly Hills Hotel and The Beverly Hilton, both of which have hosted many celebrities. Glide past elegant Greystone Mansion, which once was a popular TV and movie shooting location. Cruise past City Hall, see the famous Beverly Hills sign at Beverly Gardens, and window shop on Rodeo Drive. Pause for photos at the various sights on your path, and stay energized with complimentary bottled water and chips. Your 2-hour Segway tour of one of the most luxurious neighborhoods in the US ends back in central Beverly Hills.